Three states that strongly supported Donald Trump in 2016 -- Indiana, Ohio and West Virginia -- are holding closely-watched Republican U.S. Senate primaries today, and of all the characters in those races, Don Blankenship in West Virginia stands out as a candidate who should be the unlikeliest to win but who, in this upside-down world, may just pull one off. Self-proclaimed as "Trumpier than Trump," Blankenship is former coal mining executive who's "widely known for spending a year in prison for his role in a mining explosion that claimed 29 lives," as the New York Times describes here. Even before that conviction though, Blankenship had developed a reputation in West Virginia of being a ruthless businessman who curried favor with local politicians -- including the justices of the state's Supreme Court. It’s a storyline straight out of a John Grisham novel. For 15 years and running, two Pittsburgh lawyers fight to bring justice to a small coal mine owner driven into bankruptcy by Don Blankenship, the most powerful coal baron in American history. The courtroom battle starts in a small courtroom in West Virginia, reaches the U.S. Supreme Court and then lands in neighboring Virginia courts, where it continues today. Along the way the small mine owner, Hugh Caperton, wins a $50 million verdict but never sees a dime as Blankenship pulls out all stops to avoid payment — including contributing millions to support the election of a state supreme court justice who’ll likely vote to overturn that verdict when the case hits the West Virginia Supreme Court. 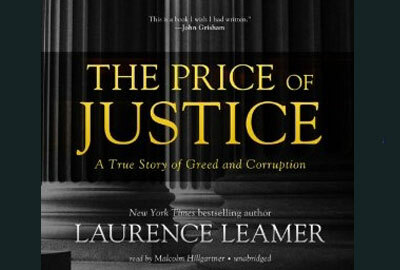 Read more about Blankenship's West Virginia brand of politics here and about Leamer's views of the case that gave rise to his book here.